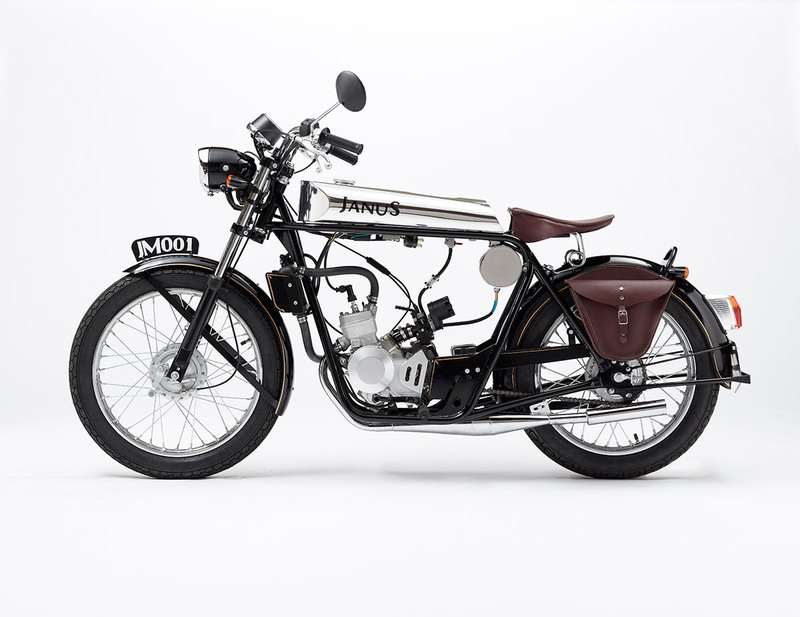 When I first saw this motorcycle, a couple of months ago, I got excited and immediately shot off an email…I wanted to find out the story behind Janus and how a small factory from Indiana created this instant classic. It took awhile (these guys are busy), but in this interview, Richard Worsham of Janus Motorcyles more than made it worth the wait. 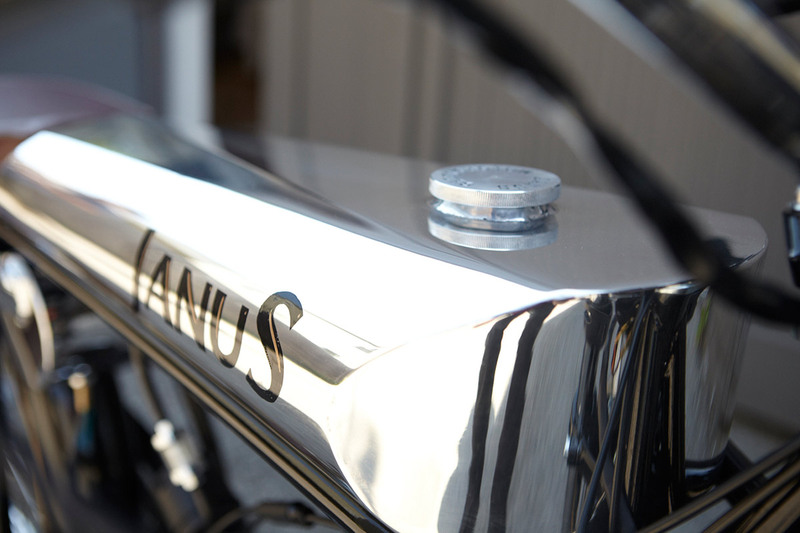 Can you tell us a little bit about Janus Motorcycles and who’s behind it? My good friend and business partner, Devin Biek, has run a vintage pedal-type moped shop for years. When I headed out here to Indiana for school I started working with him on custom bikes over the summers. We built a number of bikes for customers around the country. Over the last 5 years his company, Motion Left Mopeds, has become the largest hand-made performance parts manufacturer for vintage mopeds and smaller motorcycles in the country, with a special focus on 2T expansion chambers. We designed and built a lot of parts and bikes together and eventually decided to build ourselves the perfect bike. We had been looking to the 60’s and 70’s 50cc GP bikes for a lot of our inspiration on the custom bikes and decided to build something like that around a Puch E50 motor. That bike, the Paragon, became the vision for Janus. 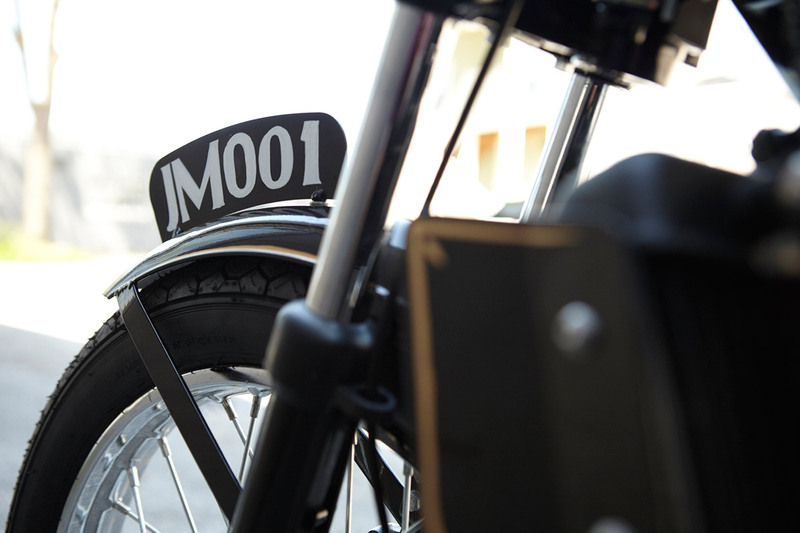 Why start a motorcycle company? It’s a leap of faith…any body try to talk you out of this? No, I can’t say anyone tried to talk us out of it, though they probably should have…It’s definitely a leap of faith. We certainly didn’t get into it like a lot of these start-up companies with the goal of finding a solution to a problem that would make us a lot of money. We just wanted to start producing smaller, stylish motorcycles. I’ve been dreaming of my own vehicle company since I could draw so I leapt at the opportunity. I definitely see some Brough Superior inspiration…what other motorcycles did you take inspiration from? Broughs have really been a big inspiration for us, both aesthetically and in terms of their manufacturing concept. Like many early twentieth century British motorcycles, Brough Superior took advantage of specialty manufacturers to supply them with their power train and transmissions. The JAP engine, replaced in later models with the Matchless unit, allowed George Brough to focus on the handling and high level of quality that his motorcycles are renowned for even today. Like a lot of those early manufacturers, we are a very small outfit with limited resources when it comes to designing, developing, and casting an original engine. Hubs, rims and front suspension are also things we would love to manufacture down the road, but we find a great deal of satisfaction in continuing that early tradition of bringing in several proven specialty components, and concentrating our design and manufacturing on a superior chassis, riding position and attention to detail and quality. Apart from the few specialty cast aluminum and electronic components, everything on the bike is manufactured within about 20 miles of our shop. Obviously, Indian and early Harley, as American motorcycle companies, are another big influence on us. 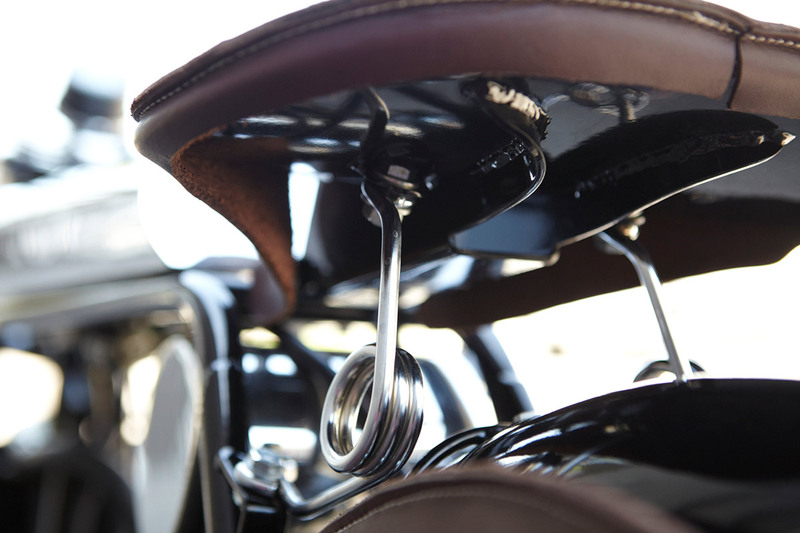 Many of their earlier models for road and track epitomize that perfect pairing of form and function that is at the heart of the best motorcycles. Zenith, especially the beautiful “Super Kim” was a special influence on my design sense during the design of the Halcyon. 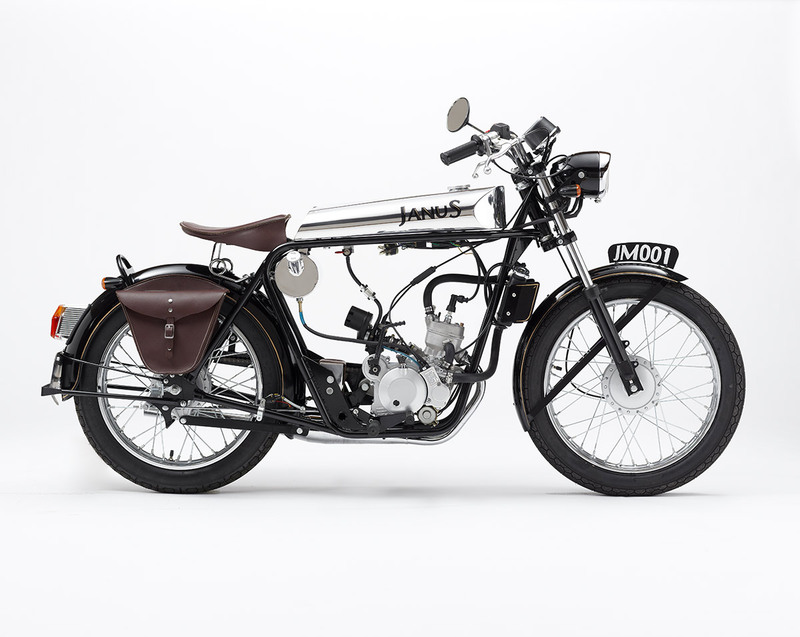 DKW put out a number of very smart little bikes in the 40’s that helped us work with scale. Of course the list could continue quite a bit farther, but those are some of the crucial bikes we were looking at. “We design and build everything by hand in and around our home-town of Goshen, Indiana.” Why go this route? Wouldn’t it be easier to outsource a bit of this work and get some sleep? We began this adventure building performance parts for vintage mopeds, and through that process discovered that we really couldn’t do what we are doing anywhere else. Starting off, the idea of outsourcing the small number of parts we produced just didn’t make sense. When you are trying to sell small numbers of anything, quality and performance have to be your central focus. You just can’t expect to sell three made-in-China exhaust systems and make a living at it. That is, I think, the heart of the renaissance in American manufacturing: initially small production runs focusing on the highest level of quality and performance. What does living in Goshen, Indiana bring to the table? Best fabrication and prototyping in the country, maybe anywhere. Anything you need to source is right down the road. One of the details that really caught my eye was the saddlebags. 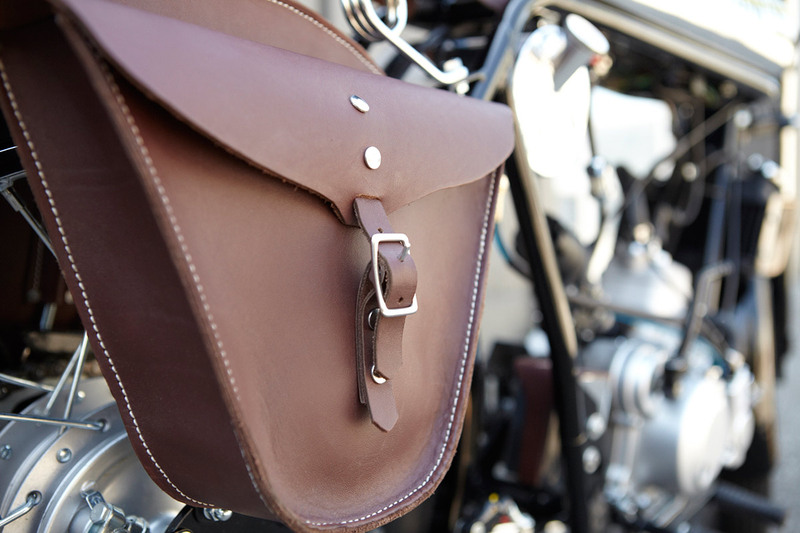 What goes into making your saddlebags? 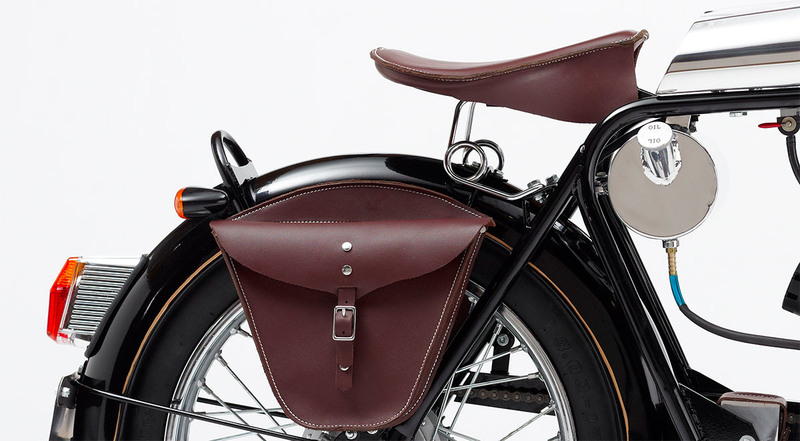 The saddlebags and seat are a made by a local harness maker. He cuts and stitches them by hand in his barn. They are made using the same techniques and tools that he uses for harnesses for horses, so a lot of tradition and experience go into making them. We supplied him with the rough shape, but let him turn it into the working product. What’s been the most challenging aspect in building your bikes? Coordinating the manufacturing of some of the specialty components like fenders that have custom tooling and a longer lead time. There are lots of delays and headaches in that process. With the knowledge that you have now, what would you have done differently in your process? I’m sure there are some details I can’t think of that, looking back, we would have done differently. I think the main thing we have learned is that sometimes we over-thought things. If I were to do this first model over, I’d probably trust my initial feelings a bit more. Everybody has advice, but you really have to stay focused on what your initial goals were, and stick with them. You’ve said, “Our bikes aren’t replicas; we haven’t designed them to exactly emulate a period from history.” Can you elaborate? What we mean by that is that we’re not trying to make a perfectly accurate rendition of a motorcycle from a previous era, imaginary or otherwise. 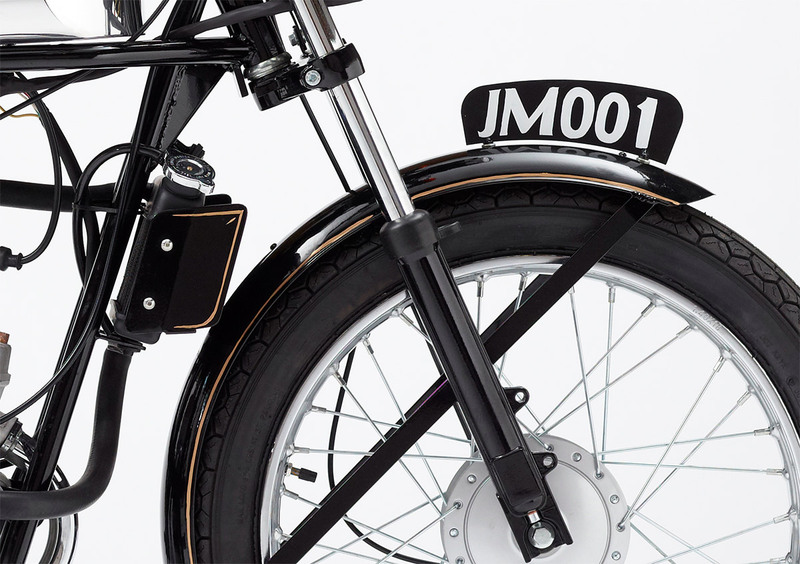 Our goal has primarily been to return to a smaller, more simple, low-tech bike, with the aesthetics that we love. For this first model it just made sense to make it a hard tail and sort of break it down to the basics. At the same time we use a modern water-cooled motor, modern electronics, switches, etc. Creating anything that seems “retro” can open you up to criticism for being a historicist, or of romanticizing the past, but we’re just as excited to face the future. It’s mainly a question of how something that is hand-made is actually put together in a small factory in Indiana. We currently don’t have casting, or carbon fiber, or stamping capabilities, so that makes some of the more traditional and more labor-intensive methods of manufacturing our best option. This isn’t retro, it’s just a different modern. I am trained as an architect, but in opposition to the majority of contemporary architects, I look for grounding and inspiration in the tradition of great design that has been developed over the last several millennia, not to a couple of disaffected architects who decided that we should all reject anything thing that had to do with tradition. I think that is what I am trying to get at with these motorcycles: a completely modern approach to a design challenge that builds off the best of the past as a sort of model for the future. The past has a lot more to tell us then the future, simply because it’s already happened. Vitruvius applied to motorcycles… Not sure how far you could run with that, but at a very basic level it’s true, almost more obviously so then with architecture. Motorcycles are one of the most moving artifacts ever made. Form and function are inextricably paired in a way we seldom see anywhere else. Who do you think is going to be the typical Janus rider? Urban or suburban riding? We see these being popular with younger creative class professionals including women, and definitely in cities. These bikes are made for the city. What’s was the process for building the bikes – strict pre-planning or making it up as you go? It depends on what part of the bike your dealing with. For example, the frame was something that went through a lot of design. We did virtual 3D modeling, took lots of measurements of other bikes, decided on exactly what rake we wanted, what ergonomics worked best with its size, how the frame could be used on more then one model, i.e. with a hard tail and with a swing-arm. Then we built it exactly to those designs. The gas tank and other non-structural elements were designed as we built them. That means we went through about seven different working tanks before we finalized the design. Same goes for many of the other parts. Where does the name Janus come from? Janus is the Roman god of beginnings and ends, of war and peace, and in a sense, also the god of the road. He represents the idea of looking simultaneously to the past and future. We were searching for a name that was both modern and classic, and the double-faced emblem of Janus embodies that rather well. 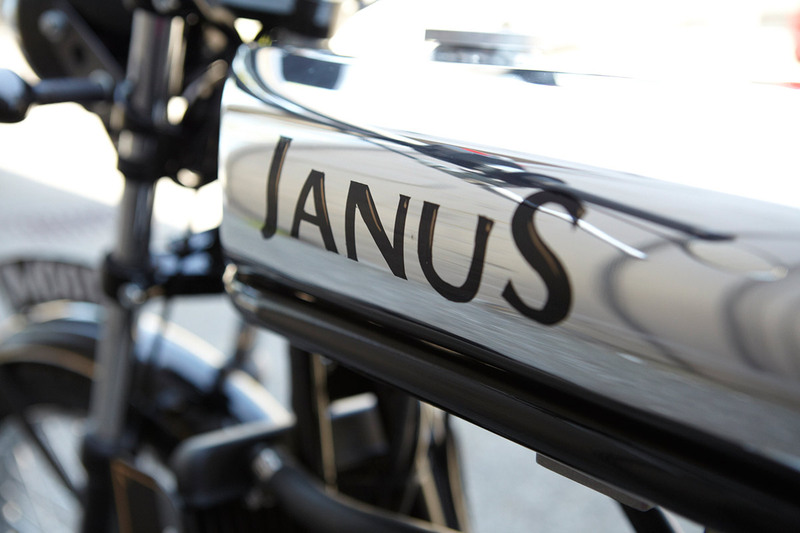 How fast will a Janus Motorcycle go? The stock Halcyon’s top speed is 55mph, although (with the right wind) you can get it up to 65mph. Cruising speed is around 50mph or so. It’s ideal for urban riding where you are easily the fastest most maneuverable thing around. When do you plan to start selling your motorcycle and how much will they cost? We are currently wrapping up production on a batch of special, pre-production units that are already sold. We are currently taking orders for the production Halcyon and expect to be delivering initial bikes by early spring. The production Halcyon retails around $5,300 including delivery, with options for a more basic model at about $3,900. What music/bands are usually playing in you shop? The things/experiences you enjoy most about living in Goshen? So many things…I’m not a native Hoosier, in fact my mother’s family is from Kentucky so I was always prepared for the worse when it came to Indiana. Goshen is wonderful though – it’s a beautiful, very urban little town with a strong start-up culture. Lots of young entrepreneurs and businesses, great food, and immediate proximity to probably the best fabrication and prototyping in the country. The constant stress? No, that’s not a good thing…Probably the liberty and pride it gives us. It’s something you can wake up to every day and be proud of. Riding our motorcycles, wrenching on vintage mopeds, fishing, letterpress printing, reading, and spending time with our families. Oh, I really don’t know. Maybe the Vintagent (Paul d’Orléans), or the inspirational people over at Falcon. Films, music, books, fashion. I think our inspiration is pretty broad. We’re never looking at just one thing. I suppose I’m personally drawn to anything that addresses how tradition engages the present and directs the future. 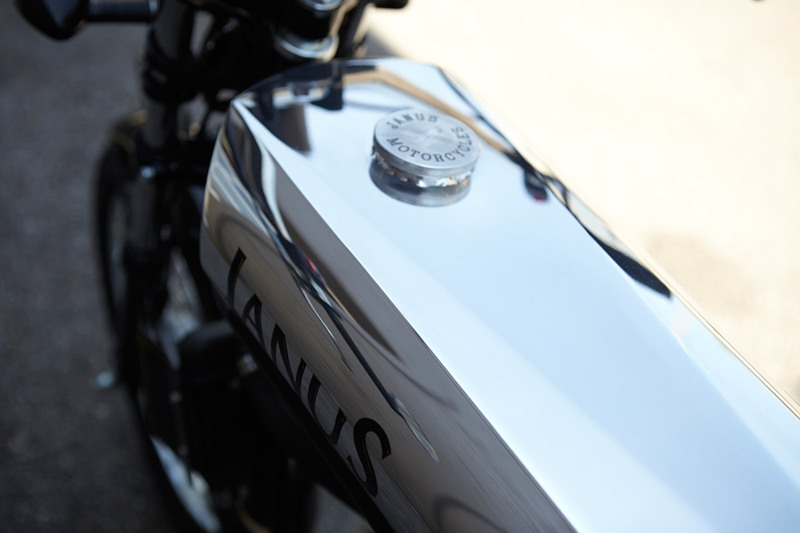 What’s ahead for you all and Janus Motorcycles? More bikes, more models, and more riders!